The United States Army Aviation community has evolved from the use of balloons in the Civil War when they first directed fire and provided support of ground troops to both planes and helicopters (gunships and transport) doing the same. The first-ever plane purchased by the Army Air Corps was in 1909 from the Wright Brothers who built a warplane with military specifications. Here are the jobs associated with the repair, maintenance, and operator and both manned and unmanned aircraft. OH-58D - Since 1969, the Bell OH-58 Kiowa is a single-engine, single-rotor, military helicopters used for observation, utility, and direct fire support. UH-1 - The UH-1 Iroquois (aka Huey) is built by Bell and is used as the Army's primary medical evacuation and utility helicopter since the 1950's. AH-64 - The AH-64 Apache helicopter is the Army’s primary attack helicopter. Made by The Boeing Co., it first entered Army service in 1984. It is regarded as the most lethal helicopter in military aviation history. UH-60 - The UH-60 Blackhawk helicopter is the Army's primary workhorse and is used for a variety of missions such as Special Operations, VIP transports, MedEvac, ground assault and more. 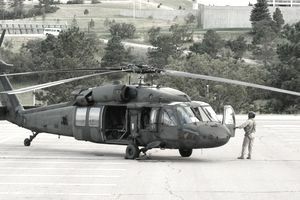 The UH-60 is made by Sikorsky and entered service back in 1979. CH-47 - The Ch-47 Chinook is made by Boeing and is the Army's primary aerial troop and equipment transport. The dual rotor distinguishes this craft from other helicopters. If you are seeking to become an Army Aviator or work on its systems, all the Army Flight Training schooling take place at Fort Rucker, in South Eastern Alabama. There is a long history with today’s Air Force as it was born out of the Army Air Forces after World War I and II. In fact, Air Force helicopter pilots still train at the base alongside their Army counterparts. The current mission of the Army Aviation Center is to develop the aviation force for its worldwide mission. This includes developing concepts, doctrine, organization, training, leader development, material, and soldier requirements, as well as provide resident and nonresident aviation maintenance, logistics and leadership training in support of the total force and foreign nations for the sustainment of joint and combined aviation operations.